Without hyperbole, one of the closest and tensest Test matches in history. Plenty has been written about the performances of the key players: Stokes, Shakib, Tamin, Bairstow, Moeen and Sabbir Rahman, whose second innings 64 not out harked back to the trial by fire of Justin Langer. What was most remarkable was the evenness of the chase. Neither side were ever on top, with Bangladesh always slightly behind, except briefly before Batty got one to kick on Mushfiqur, and before the fall of the third wicket. This evenness is remarkable when you consider how rare it is for a game to be balanced. 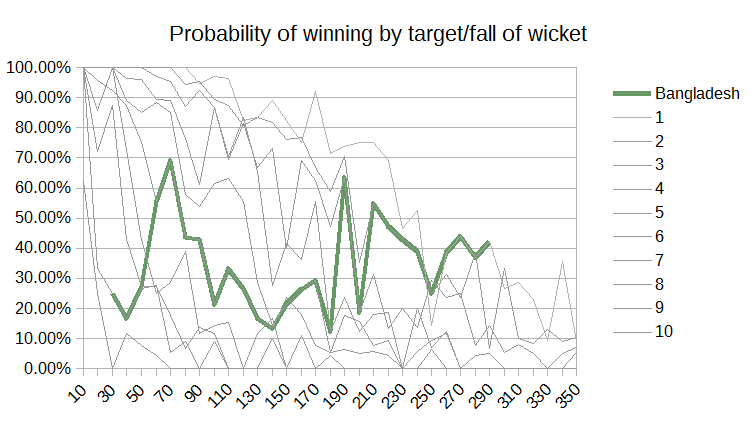 Teams chasing less than 20 runs per wicket tend to win 80 or more percent of matches, dropping to less than 20% when they need more than 30 runs per wicket. For almost all of Bangladesh's chase though, they sat in between those two averages, never getting ahead, but never so far behind that the game was gone. But that also meant forever teetering on the edge. Falling just short is no barrier to overall success - Australia have made a habit of it for decades - and if anything, the confidence that they can match a side like England over five days ought to herald a new era of better results. It will be interesting to see how long it takes to get over the hump. In the meantime, their rating kicks a little, and the chance to break into the top eight in a year or two beckons. Like England, Pakistan failed to beat their expected margin against the West Indies, but they were never in danger of a loss, having declared at lunch on the fourth day with 455 runs to play with. The match played out more or less as expected. Younis Khan (127) returned and he and Misbah (96) allowed Pakistan to post 452 in the first innings. Once again, the West Indies leaked too many runs, though at least Gabriel and Holder were in the wickets. Bravo, opening was the top-scorer with 43 in their disappointing reply. The total of 224 was beneath the follow-on, but with time, a day's worth of bowling behind them and Yasir Shah eyeing the pitch, it was no surprise to see Pakistan out for another two sessions. It was Yasir (6/124) who ground his way through a stiff West Indian resistance. Eight players passed double figures, with Blackwood (95) and Brathwaite (67) top-scoring and Chase and Hope soaking up nearly a session of deliveries between them. Given the expectations, this tour has not been a bad one for the West Indies. But it isn't clear they have a path to victory given their bowling attack. For most of the past decade their bowlers have sprinkled rare days out - such as Bishoo in the first test - with struggle. Their recent batting has occasionally been gritty, but they've had only five 150 run partnerships in the past three years, three of which involved Chanderpaul. The top six nations have, by contrast, had a minimum of 18. Ultimately that is talent, but it is a talent gap without any "franchise" players to build around either. For Zimbabwe, there may be more riding on this match at home against a middling ranked full member than meets the eye. As the ICC's slow march towards a Test championship or something they can rebadge as such continues, the question of mismatched games against the weaker full members looms over the discussion. Sri Lanka's habit of destroying weaker sides in the early 2000s was one of the reasons Zimbabwe voluntarily withdrew from Test competition. This match, against a much weaker side, but one that showed plenty of ability and promise against Australia, will clearly highlight the divide between the bottom and those who might soon find themselves at the bottom. A close and compelling match will do much to encourage a kinder appraisal of future match-ups. A blow out may reinforce the widely held belief that it is a waste of time entertaining the top and bottom. With Bangladesh bridging the gap, the African side might find themselves stranded on the wrong side of the river. Home sweet home. In the past couple of years Australia have turned into the worst travellers in world cricket. Their record at home, on bouncing flat tracks that reward batsmen who can pull and cut, and bowlers with pace and patience, is exemplary. South Africa are better suited than most to challenge Australia at home, and have won the series on their last two tours. The challenge for them will be consistently backing up their bowlers with enough runs. Their last series against England was marked by some very high totals and some horrid collapses. Starc in particular is capable of ripping through a lineup and both sides are capable of losing a match in a session. Some comment has been raised on the choice of Mennie over Bird on batting grounds. There is merit to the argument given how little separates the two players on first class bowling averages, and how vast the gap in lower order runs. The alternative argument, that you should always choose the better bowler regardless of the gap in their bowling, or the runs another contributes with the bat or in the field, would logically mean giving up 20 or 30 runs with the bat for a 1 or 2 run gain with the ball. Good bowlers are far and away the most valuable players in Test cricket, regardless of whether they contribute with the bat, but they need to be obviously better than the alternative. Bird, excellent player as he is, probably isn't, and in any case, there is no guarantee either would get a cap in Perth. The pre-, and in many cases, post-series assessment of India and New Zealand's relative levels of ability are not borne out by the rankings. India have increased their lead at the top, defeating New Zealand by marginally more than expected in the first two tests and by a larger margin in the third. Bar the fourth innings of this match their batting held up well, without providing the sort of runs they'd need to win. Similarly, barring the first innings here, where Kohli and Rahane produced a 365 run partnership, they largely kept India in check. But New Zealand needed to play better than their rating suggested, and India worse, was there to be an upset. India played consistently well throughout, and in Ashwin (13/140 here, 27/480 in the series) they have a match-winner. No disrespect to them, but New Zealand aren't that strong a side, who are undoubtedly worse without McCullum and Southee, playing in conditions they have little experience in. The result was near inevitable, provided they couldn't find enough runs to draw a match - a relative rarity in modern cricket. Boult had a decent series, incidentally, and only in the final test did the Indian batsmen make hundreds. New Zealand made none, and even Williamson averaged below 35. India will be hoping for more from Yadav, and their openers but they look well placed for England's tour; a side that bats similarly deep and makes up for a lack of spin with a solid pace attack. For a team that made 3/579 in the first innings, Pakistan made hard work of this match. Partly this was from some resilient West Indian batting, with Bravo making 87 (258) and 116 (249) with support from Samuels and Holder. The grinding meant that despite batting 232 overs against only 187 for Pakistan the West Indies came up 56 runs short. The West Indies might have got closer if they'd bowl better, as every bowler leaked runs at an alarming rate. That they managed to get close enough to scare Pakistan came down to Bishoo taking 8/49 in the second innings - though not without luck as Pakistan tried to build a lead. Ultimately, given the timing of the victory and the margin, Pakistan batted, declared and collapsed almost exactly as they needed to. The top order of Sami Aslam (90), Azhar Ali (302*), Asad Shafiq (67) all average in the 40s and there is batting below. Yasir Shah was somewhat over-used, but eventually broke through. But their ranking drops, as they missed expectation, and could drop back below England in future test matches. For the West Indies, this result may be as close as they'll get, but after the mostly dispiriting matches against India, making Pakistan work for a victory is a big improvement. The bad news for England is that it is going to be very difficult to beat the margin against Bangladesh. Their one day performances indicate a side that is more competitive than at any time in the past; but without a test match in over a year, their ranking won't yet show it. The good news is that their game weight is as low as 6, compared to England's 21, so any rating adjustments will fall largely on the home side. The most promising sign for Bangladesh is the increasing frequency of first innings leads. Having not had a lead batting second until 2012, they've now had one in 5 of their past 11 attempts, with five draws and a win (over Zimbabwe) in the same period. They've been less successful batting first, but if they can continue to be competitive in the first innings it is only a matter of time before it translates to victories across both. England, whose record against spin can be patchy, are not the guaranteed victors they were on previous tours. Sometimes the form table is a more reliable guide, and in this case it points to a Namibian side in deep decline from the days when they were challenging for associate trophies. P.N.G. are definitely an improving side, and they are finding their feet in the longer format. Assad Vala (144*) scored his third century in four matches, and he anchored the islanders' score of 311. Only Sarel Burger (52*), inexplicably batting at six, prevented a complete disaster as Vanua and Siaka (contributing much more with ball than bat) rolled Namibia for 146. Scholtz completed a 10-wicket haul (11/170) in Papua New Guinea's second innings, but they had already set an insurmountable target and Vanua and Siaka were again the key wicket-takers in a comfortable fourth day victory. Papua New Guinea rise to fourth in the table. Their ranking has a way to cacth up, but form would put them just below Hong Kong, 100 points below Scotland, while Namibia would be just above Canada. If they only played enough matches to keep the ratings accurate. After a short hiatus Andrew Nixon (@andrewnixon79) joins Russell Degnan (@idlesummers) to discuss some recent tournaments and preview World Cricket League division four. But first, they look at the almost concluded Asian women's world cup qualifiers won by Thailand (0:20), the tours of Afghanistan to Bangladesh (5:20) and Ireland to South Africa (7:10), the Africa T20 Cup (11:07) and tournaments in Namibia and Kenya (12:25), and Division two under 19 World Cup Qualifiers in Africa and Asia (16:43). The ICC had their October meeting in Cape Town which led to a number of outcomes for associate cricket and some unsurprising non-decisions (22:20) and USACA do what USACA does best (32:40). There ia an extensive preview of WCL4 (37:33), and the final matches in this round of the Intercontinental Cup and WCL championship (48:12). This is the best team India has ever had. Certainly, that is a disputable point, but after their victory in the second Test India reached their highest ever rating. While they achieved the feat at home, against a relatively weak New Zealand side missing their best batsman and best bowler, in a match that went nearly exactly to script, they did so in a manner that past Indian teams generally would not. In a low scoring match, they got contributions from Pujara and Rahane in the first innings, and Kohli, Sharma and Saha in the second. Kumar and Shami showed some tricks and speed in the first innings, taking 8 wickets, and Ashwin and Jadeja did the job in the second, with six. Unlike Indian sides of the past, built around awesome batting and spin bowlers but little else, this Indian side bats deep, they field well. It is young and improving with much to prove, though their recent away record is better than most with five wins and eight draws, but they aren't (yet) rated as a great team. Merely the best their nation has produced, and almost certainly the one with the most potential. Only three years ago these looked like two sides heading towards each other. Pakistan were ageing with few young batsmen on the horizon and their best bowlers suspended; the West Indies were bringing in youth and slowly climbing out of a twenty year hole. Since then, the former have got the injection of youth they required, a coach that brings the best out of those talents and some quality bowling. The latter have drifted, partly for administrative reasons, and partly as those young players have not developed, slipping further from the seven teams above them, as series after series results in heavy defeat. This will most likely be no different. Pakistan are a much better side, playing at "home" with the recent successes of the English tour behind them. The West Indies still have started again with a young side that had its moments against India, but not enough to threaten a victory. The hope is that they'll continue to show enough to prevent this being an ugly series.